So you’re just getting into Lacrosse, or you’re buying a new head for a friend or relative who plays. Either way, we’re going to help you! We’ve researched and reviewed a selection of the best Lacrosse heads to bring you the best recommendations in our lacrosse head buying guide. Check out the factors we used to determine which heads are the best below. Then we can show you our picks for the perfect lacrosse head! Let’s get started. 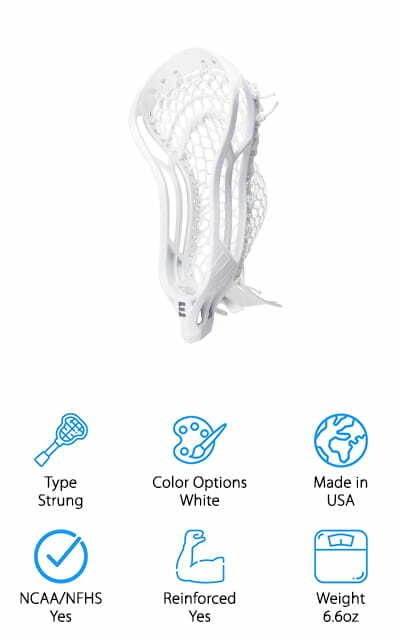 Type: Lacrosse heads can come strung, which means the net is already in place. More often, they come unstrung and allow you to choose your own netting and put it on. It’s a personal choice more than anything. Color Options: This is the number of colors that the head comes in. They are often coordinated with teams or else left up to personal preference. There are usually a lot of options for different colors in plastic heads. Made in: This refers to the country of manufacture. The vast majority of the time, the lacrosse heads we looked at were made in the USA and ship only within the USA. This is important for some people to know. NCAA/NFHS Compliant: Is the head regulation for both college and high school levels of play? Sometimes they are one or the other, but most are universal, meaning they can be used in all levels of competition. Reinforced: Is the head reinforced? You’re going to want something that’s going to last instead of breaking the second time you use it, so look for something with a reinforced scoop or side rails to make sure that it’s tough. Weight: This is how much the head weighs. Some positions might want a lighter head to make their game go smoother, while some people need a heavier piece to enable them to play well. It depends on your position and preference. 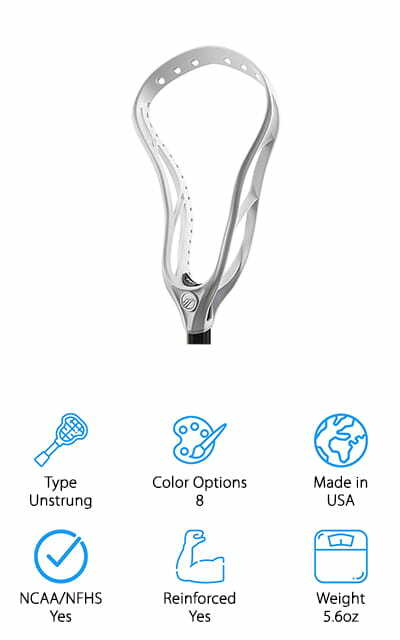 Now we can show you our lacrosse head reviews! We’ve brought you only the best for our recommendations. Choose one based on what type of play you like, and what type of head that you need for your position. Check out our top pick and budget pick first to get an idea of what you’re looking for, and then browse the rest of the list. You just might find your new favorite sports accessory! Our top pick for the best lacrosse heads for sale goes to Maverik. This particular model, the Optik, is made specifically for an offensive player. It’s lighter and stiffer than just about any other head on the market right now, so it’s perfect if that’s the position that you play or the parameters you need. It’s technologically advanced! The design is pinched like some other companies, but the 2-strut design and the dual scoop put this head far above the rest. 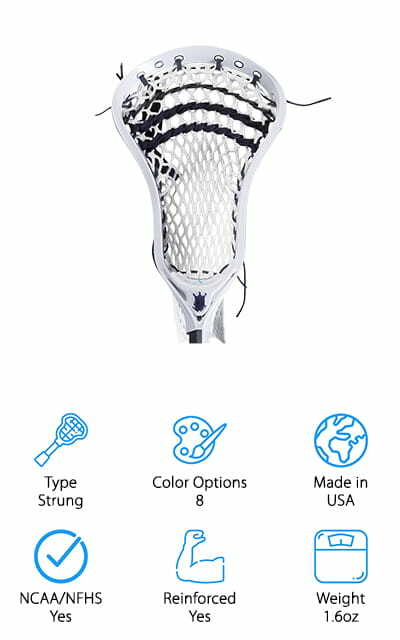 It comes unstrung, so you can put whatever type of netting you want on it, as long as it’s compliant with NCAA and NFHS. This head is by itself, so you should be okay for all levels of play. There are eight color options, including black, blue, green, orange, red, white, and yellow, so you can customize based on preference or even your team! The bottom rail is so sturdy and won’t break when you need it! 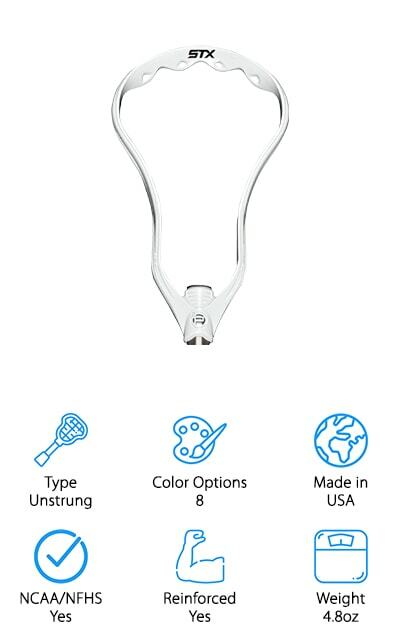 The Brine Clutch Lacrosse Head is available in two specs – the high school or NFHS-specific design, and the universal spec, which is slightly wider. It’s available in four distinct colors, orange, green, navy blue, and black. It’s both lighter and stiffer than the models that Brine made before – it’s the culmination of technological research and feedback. This is a great offensive head! The sidewall is designed in such a way that it shaves off a lot of weight while still remaining stiff enough to be every offensive player’s dream. These really are some of the best cheap lacrosse heads – quality and technology working together to bring you the best game available. There’s a deeper pocket so it’s better for catching, and a greater release channel for more accuracy. We love how dedicated the company is to constantly evolving their stock as they get feedback and do testing. That’s the mark of a wonderful brand that’s out to do their best! The STX Super Power Head is a universal head that is compliant with the rules at all levels of play! It follows the design of the Proton Power head, which is the best head that you can get. This one uses the same aerodynamic, streamlined model as that head. The scoop is reinforced so you can easily catch the ball when it comes your way, and side rails as well to support your scoop. 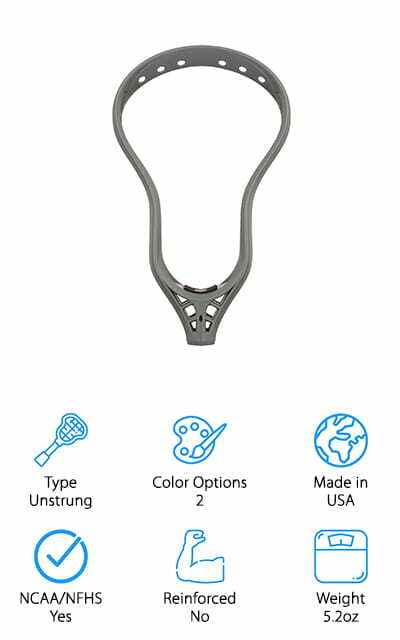 There are additional holes for stringing along the sides of the head, to make it easier and to make your pocket the best it can be! It’s got a slight forward lean on the front that allows for easier catching. It comes in eight different colors, including white, three shades of blue, red, orange, and grey. That’s a great level of customization that you can use to represent your team. This one is unstrung, so it allows you to choose your string type as well! 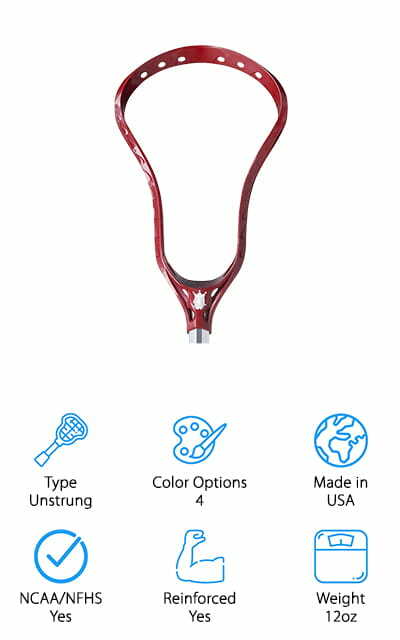 The Warrior Revo 2 is unstrung when it comes to you, so choose what net you want wisely! The sidewalls on this head are extremely tough, and it has a much wider face than some of the more offensive heads. This is definitely a defender’s head, perfect for the strength you’re going to need! The scoop angle is pretty amazing and allows you to scoop up the ball while you’re on the run. It’s extremely stiff and durable so that you can defend your position with ease. It’s one of the best lacrosse heads for middies on our list because of that all-over durability that you’re going to love! All the opposing offensive players will hate this head, and that’s a great thing to witness. It goes great with a middle pocket, and since you have to string it yourself you can do what you’d like with that. Get a good shaft and you’re ready to go! The ECD Mirage Head is one of the best midfield lacrosse heads, made specifically for the offensive player. It comes in either white or black, so it’s fairly simple. Mirage is made using previous knowledge as well as 3D printing, so their design could be perfected – that’s how you know it’s going to be good. 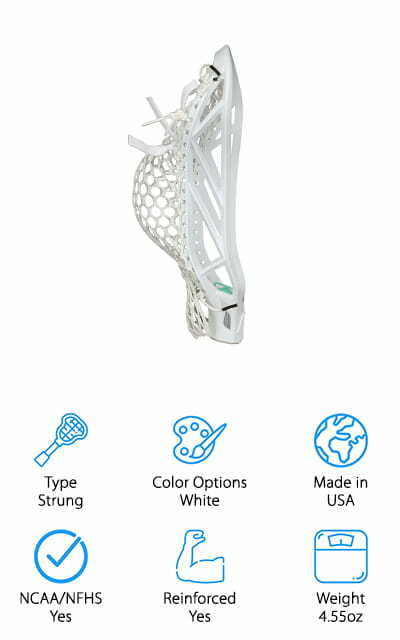 Every bit of this head was designed to create the perfect pocket when you string it, from the holes to the curves. You’re sure to get the perfect catching pocket with this head because that’s what it does best! Midfield offensive players are going to love this head. It comes unstrung so you can make it your own with the net you like. It’s compliant with all the rules and regulations at every level of play, including the NCAA college league and the NFHS high school standard. This makes it a universal head. It’s reinforced as well, so it’s super stiff! The Brine Clutch III is the first had on our list to come already strung. As we saw with the previous head from Brine, they are dedicated to using technology to make the best heads that they can – and the Clutch III is not an exception to that rule. It’s got the stiff sidewall technology that trims off weight as much as possible, as well as being molded and colored to your preference. The color options include black, blue, green, navy blue, orange, red, purple, and yellow – a wide variety for your team and for your personal choice. It’s one of the greatest middie lacrosse heads we’ve seen, and it was powerfully created for offensive players. The company even boasts that this is their most powerful head! Every single thing about this head has been developed in some way to create the best head that they can. Brine is amazingly dedicated to giving you the best game! There are good lacrosse heads, and then there are great ones. The StringKing Mark 2D is one of the great ones. They have used feedback and improvement models to help create a stiffer, stronger head. They’ve used modifiers to the low-stress area, shaving off weight so that the high-impact areas of the head are stronger, thicker, and more durable. That’s a pretty awesome idea! This particular head is meant for defensive play, and as such it’s wider and much stronger than some of the offensive ones. 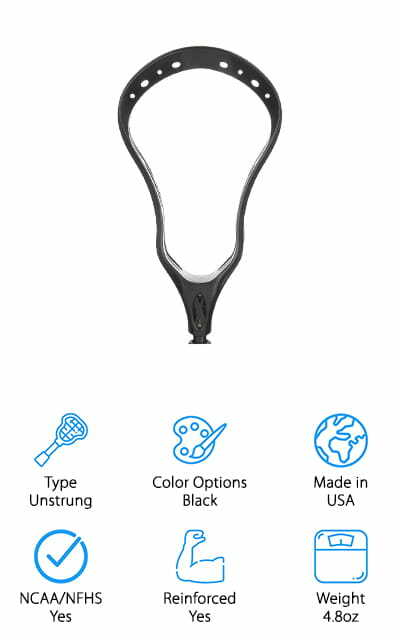 There are 29 different sidewall holes for stringing, and these also work to help create a pocket that works for everyone! It also has a newly-engineered scoop so you can get balls off the ground quicker. They have a special bolt to attach it to a shaft that prevents rattling and decreases the flexibility, so you get more power and accuracy. We love that they are continually improving, passing that quality on to you! The Epoch Hawk is one of the best lacrosse heads on the market, and it’s being used by just about every professional lacrosse player in the world right now! It’s designed with offensive players in mind, with a high-pocket design that will let you score and score and score! Instead of being made of plastic, the head is made of a polymer, which gives it more strength and the maximum velocity to the ball. The profile is laid back instead of pushed forward, which gives this particular head a distinctive look. You’ll always be able to tell when someone’s using a Hawk, and they’ll be able to tell that you are as well! This company really has done their research, comparing and reviewing all the other major lacrosse heads to bring you one that has all of the pros without any of the cons they do! We love their dedication and the knowledge that they have to make this head! Wolf athletics makes this lacrosse head, which definitely throws its hat in the rink as one of the best offensive lacrosse heads we’ve seen on our list. It’s so light that there’s hardly anything there at all, and you’ll feel like it’s a natural extension of your arm.Wolf Athletics has tested and retested these strenuously for durability, and it’s held up incredibly well in every test. 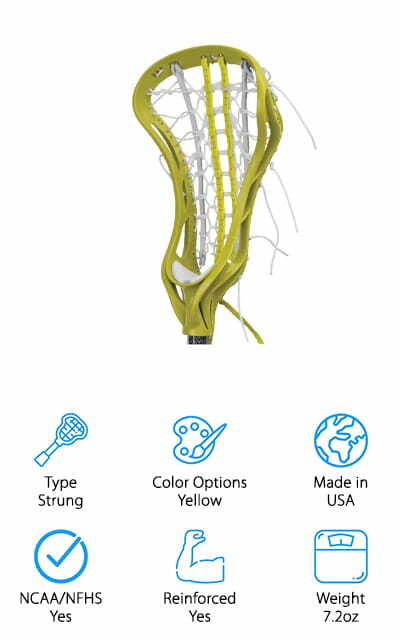 There are 19 sidewall holes so you can use any pocket that you want and string it how you see fit. It’s got a flatter scoop on the front to make it that much easier to get ground balls into your possession with ease. The side rails are designed with enough flex that you get that perfect-shot snap when the ball leaves the netting. It’s already strung when you purchase it, but that doesn’t mean that you can’t get the net that you want and restring it – the one it has is pretty amazing anyway. This deBeer Lacrosse NV3 head also comes strung, which is pretty amazing! It’s an incredibly versatile head that will be great for just about every age and position – it’s truly universal! This would be a great head for the beginning Lacrosse player who doesn’t quite know what position they want to play yet and doesn’t want to buy another head to test them out. It’s strung with the Gripper Pro Pocket, so if that’s your preferred pocket, you won’t have to restring it! However, that is an option! It has a full offset side wall and a traditional face shape. The pocket that it comes with has recessed lace channels, so the string will be durable for longer. We love how versatile this head is and how many different things you can do with it. It’s beginner friendly, and it’s even the perfect gift for someone who is starting in high school, trying to figure it out.